2.6T Car Recovery A-Frame. We have dedicated couriers for our deliveries. In case of any problems, we're here to help. 2.6 Ton Recovery Towing A Frame. Fitted to towed vehicle in minutes by looping the chains over the wishbones which are then tensioned & locked to the A-Frame. Once tensioned they will not need to be re-tightened again for the time of your journey, once the A-Frame is completely secure put the key in the ignition of vehicle (steering lock off) & away you go! The vehicle will follow you in a straight line, & when you turn into a corner it will follow you smoothly in the direction you are going, there should be no grinding or unfamiliar noises when in use. 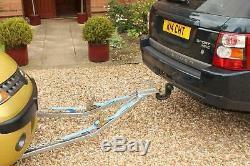 This is a well made extremely versatile piece of equipment that provides a convenient & safe way to tow vehicles (2.6 tonne maximum) its so easy to fit, & so easy to use & can be easily packed away & stored in boot of car in minutes. 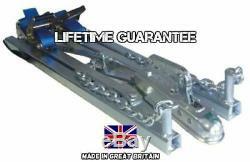 LIFETIME GUARANTEE OF ALL PARTS MANUFACTURED BY EZY TOW. Laser cut components for close tolerances, hi tensile lock nut fittings & quality dekra tow hitches. 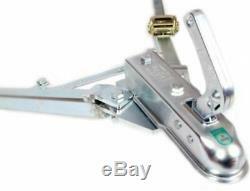 2.6 tonne pulling capacity (750kg weight bearing capacity)zinc plated silver for long life and lovely look finish, not spray painted or by hand with a brush like others. Hi specs and close tolerance ensure rigid unit for maximum control. Specification: swl 2.6 tonne. Manufactured here in the UK. Total boxed weight: 24 kg. Entire frame supplied with locking nuts for complete safety 5mm heavy duty thick walled box section joints, heavy duty laser cut 8mm thick header plate and components. Centre joining sockets 2x welded inside and out for incredible strength! 20mm leg posts 2x welded inside and out for even more strength. These are strong and will not bend unless misused. 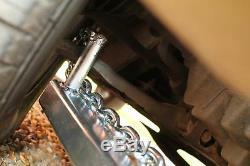 9mm thick zinc plated chain. Zinc coated so will not rust like painted ones! You need to abide by the law when using this product and when using this product it is solely the responsible of person towing vehicle. Not to be used for towing any transit vans or 4x4. Small vans and cars only! It is the condition of sale that the use of this equipment is beyond our control. It is up to the user to ensure the correct, proper and safe use of this equipment and alterations should never be made to the a-frame. Ezy tow will not be responsible for any damage to any vehicle or injuries to any persons due to misuse or neglect of this equipment. Vehicles being towed are the full responsibility of the driver. The item "BRAND NEW 2.6T CAR RECOVERY A FRAME TOWING DOLLY TRAILER GARAGE TOW ZINC COATED" is in sale since Saturday, November 24, 2018. 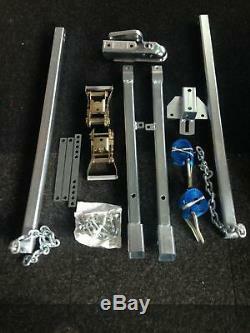 This item is in the category "Vehicle Parts & Accessories\Car Accessories\Trailers & Towing\Tow Poles". The seller is "ezyt-70" and is located in Tamworth, Staffordshire. This item can be shipped to United Kingdom.